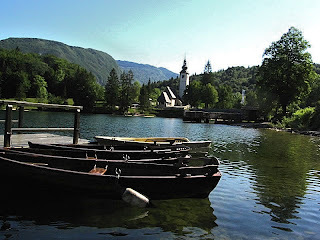 Really amazed when I saw a very beautiful scenery Bohinj. 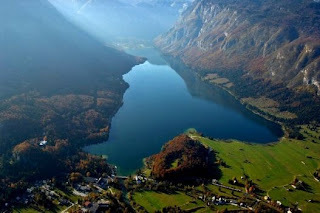 Bohinj (Wochein in German) is a lake and the valley is situated in the Julian Alps, north-western Slovenia. Colors of nature, really make tourists fascinated, though its location is quite hidden from the crowds there. This is the most amazing place that should not be missed. This place is located in a tunnel or cave stone-covered lake, mossy rocks and a little greenery. But on the other hand there are also water colors like green, blue and some are yellow. The stones are very beautiful and shape the character of the canyon carved by water droplets due to the clear as crystal. Leaves will fall off in autumn and in a vortex. Bohinj lake opened to the public since last year, with the natural attractions are stunning. Not only the valleys, lakes and mountains, there are also nearby Bohinj Railway Tunnel, kayak and canoe area for winter snowboarders.